NBC Sports has announced their Premier League TV schedule for the first three months of the 2013-14 season, which includes an unprecedented 10 matches on their free over-the-air NBC network. Those games are Swansea-Man United (Aug. 17), Aston Villa-Liverpool (Aug. 24), Crystal Palace-Sunderland (Aug. 31), Everton-Chelsea (Sept. 14), Swansea-Arsenal (Sept. 28), West Ham-Manchester City (Oct. 19), Arsenal-Liverpool (Nov. 2), Norwich-West Ham United (Nov. 9), Manchester City-Tottenham (Nov. 23) and Newcastle United-West Bromwich Albion (Nov. 30). Altogether between August 17 and December 1, NBC Sports will broadcast 69 games on live television and all 130 via their app NBC Sports Live Extra. Out of the 69 games to be shown live on US television, 10 of them will be on the over-the-air NBC network, 2 on CNBC and the remaining 57 on NBC Sports Network. Additionally, 27 games of the 69 games will be simulcast in Spanish on Telemundo/mun2. This means that at least five Premier League matches per week will be shown live on US television for the first three months of the season. 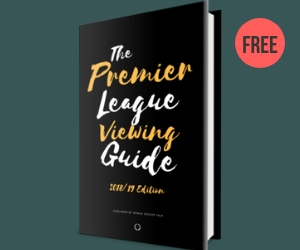 For subscribers who will have access to Premier League Extra Time, they’ll be able to watch all 61 games that aren’t being televised on NBC, CNBC, NBC Sports Network or Telemundo/mun2. As a result, TV providers who offer Premier League Extra Time in addition to NBC Sports Network and other NBC channels will be able to offer soccer fans all of the Premier League games live via TV. As of press time, the TV providers that will offer its subscribers Premier League Extra Time are DirecTV, DISH Network, AT&T U-verse, Cablevision’s Optimum, Comcast Xfinity TV and Suddenlink. For access to NBC Sports Live Extra — the web, mobile and tablet app — the following TV providers have signed up to offer it to their subscribers: AT&T U-verse, Cablevision’s Optimum, Comcast Xfinity, COX, DirecTV, DISH Network, RCN, Suddenlink and Verizon FiOS, as well as many other TV providers. Noticeable by their absence from both lists are two major TV providers in the United States — Time Warner and Charter. 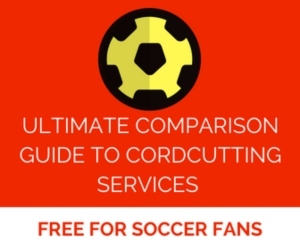 If you’re a subscriber to either of those providers, it’s time to either consider switching providers in time for the new season, or to contact them today by phone to find out if they’re even planning on offering access to Premier League Extra Time and NBC Sports Live Extra. NBC’s coverage of the Premier League begins at 7am ET on Saturday, August 17 for the live match between Liverpool and Stoke City on NBC Sports Network. All games will be preceded and followed by Premier League Live pre- and post-match shows from the brand-new NBC Sports Group International Broadcast Center (IBC) in Stamford, Connecticut. Gaffer, who will carry the Community Shield match? It’s Fox Soccer Channel’s last stand! What used to be a perfect weekend is now all turned rather stressful! Can anyone guide m won where on TV or on line I will be able to see EPL matches specifically Arsenal? Wait, I’m confused. I thought Fios would have PL Extra Time because they also had NBCSN? Or am I wrong? Stupidly read the comments before the article. I guess a number of providers are now offering EPL Extra Time. Right there with you. Don’t know when that was decided or announced. Hm, okay. I’ll send Verizon an email today. Thank you. Verizon FiOS have opted in for NBC Sports Live Extra, but not Premier League Extra Time. Be sure to call Verizon FiOS and tell them you want it so they know there’s a demand. I thought this too. Does this have anything to do with Comcast/NBC’s merger? Hopefully not, and this is changed before the 17th. So COX has agreed to support NBC Sports Live Extra? If so, this is great news. Will keep refreshing the app waiting for the option to show up. Yes! Great news! I too still don’t see the Cox option on the app, but I’m sure they will be updating in due time. Now we just need to know if Cox is going to carry Premier League Live Extra channels. 3 weeks and some change to go! So that was direct from NBC? In a new press release? Wait, no 10 am games if you don’t have the spillover channels or is it not updated yet? They haven’t announced many of the 10am ET games, but one of them — at a minimum — will be shown live on TV on NBC Sports Network. 10:00 matches will be on NBCSN. They just haven’t decided yet on which ones. Are you guessing or do you know? Thanks, mates. Their decision to announce the televised games 1 by one via their twitter account with typos and without all the necessary information was an incredibly poor one! But the FA Cup and Capital one Cup is still on Fox correct? Capital One Cup is on beIn Sport. Not sure about the FA Cup rights, but I think Fox still has em. Capital One Cup is still on beIN SPORT, while the FA Cup will be on FOX Sports 1/FOX Soccer Plus/FOXSoccer2Go. Looks like all Saturday dates for OTA broadcasts. Manchester derby pt 1 on Sunday Sept 22. That one is scheduled for NBC Sports Network, which isn’t a free-to-air OTA network. When did they announce you could get the web app through DirecTV ? I thought your article the other day said that was NOT confirmed. wait, when did they announce directv will carry live extra? please tell me that’s not a typo…i’m definitely not complaining, but i don’t remember seeing anything mentioning directv had reached an agreement. Do we know yet if these channels are going to be something that a cable provider picks up across the board in all areas, or is it going to be up to the local providers to actually offer these overflow channels? I have Xfinity which for once is a good thing, but if my local operation still has to choose to offer the channels I’m doubting they will come through. Good news is that with the online app, and with plenty of fans still looking for access to even that, Premier League Extra Time is looking like a luxury. I contacted Time Warner last week and they said the are currently in negotiations with NBC over adding NBC Sports Live Extra and Premier League Extra Time. Though from this article, it seems TW should not have to negotiate for the Sports Live Extra access since it was offered to all prviders free. Correct. There’s no negotiation involved. All Time Warner has to say is yes. Just to clarify for those Verizon FiOS customers… Right now, we will only get NBC Sports Network and NBC Sports Live Extra. It would be great if FiOS adds the Premier League Extra Time channels, so we would have television and online access to all matches. Please contact FiOS and let them know that they need to add the Premier League Extra Time channels! Unless I am wrong (and I really hope I’m not), NBC Sports Live Extra gets you the choice of ALL games that you can run via the internet. Won’t be coming in HD through the TV, of course, but with a decent internet connection speed plus an HD monitor it effectively gives you the same thing. FWIW, a guy I talked to at FiOS said they did plan to offer Extra Time. Might have been BS’ing me in order to get me to sign, but as I say the internet option + HD monitor is a decent workaround. Monitors are actually pretty cheap, too, for those who don’t have one. Yeah, I understand I have the NBC Sports Live Extra as a “backup”, but it would be nice to have the Premier League Extra Time channels, so everything is televised, and I won’t have to connect my computer to the TV or purchase Apple TV, which is what I am considering for the NBC Sports Live Extra. Thanks for that info. I may have to get in touch with Verizon as well. A great (legal, too) alternative for Verizon customers, but nothing beats a couch + big screen + remote. So Is fios getting premier league extra time or not. Apple TV is way simple, straight-forward, and cheap. not a bad route if that’s the route you have to go. Google’s new Chromecast would be even better and cheaper, $35. Can “airplay” any Apple, PC, Mac or Android device to your HD TV. Only problem, tthey’re all sold out till end of August but Amazon and Google is waitlisting orders. And to top that off, they just sent me a note that they were going to start charging monthly rent for their modems. Two of which I just returned to them having cancelled the service over this issue alone. NBC is offering Premier League Extra Time free of charge to TWC. All TWC needs to do is to create the bandwidth to allow the channels to appear. This btw is the same company that says things like “People dont want Gigabit internet because there isnt any use or need for it”. I have them as my internet provided sadly but DirecTV for TV so im lucky there. I’ll have to wait a bit to leave. These negotiations can go to the wire. I know that RCN charges $15 for Fox Soccer Plus(probably a grip of Champions League and Europa games) and doesn’t have beIn yet(Capital One Cup.) TWC’s usually pretty good on the soccer front. I’ve gotta say that this whole announcement today doesn’t really move the needle for me since the 10 am decisions haven’t been made yet and we will only be getting one match there on NBCSN the majority of weeks. This will be less coverage for me compared to last year(on the telly…I bought my big screen for a reason) if my provider doesn’t pick up Extra Time. You and I were typing more or less the same exact response at the same time. To be fair, we don’t know the TV schedule for many of the 10am Saturday games yet. One of them, at a minimum, will be shown on NBC Sports Network. More may be shown live on TV. We’ll know soon. It looks like the 10am slot will feature 4 games on Premier League Extra Time, and one game on NBC Sports Network. So for the 10am timeslot, fans will want to have NBC Sports Live Extra and/or Premier League Extra Time at the ready if the game on TV is not what they want to watch (or if they want to watch everything). I have to say that i’m a bit disappointed at not announcing the 10am games, as well as the fact that we were led to believe that CNBC & MSNBC would be picking up the games not shown on NBC or NBC Sports Network. At first glance, this really doesn’t look a whole lot better than what we’ve had in the past with Fox Soccer / ESPN. Fox soccer didnt offer every game live in HD. Cody, you’re a bit mucked up about the role CNBC & MSNBC will play. CNBC (along with USA Network) will be used in the few days where NBCSN can’t air games for a certain reason. MSNBC is expected to be one of the channels alongside NBC, NBCSN, CNBC & USA to carry all 10 games on the final day of the season. The deal overall is better because if you have a provider that offers Extra Time/Live Extra – every game including all 10am ET games will be available live. This is the first time I’ve seen it confirmed that Dish Network will carry Premier League Extra Time. Is this correct? Everything in the article is confirmed with NBC. So is Direct tv offering NBC Sports Live app access , last I checked under providers in the app DirecTv was not there. Any idea on rebroadcasts on NBC channels later on game days? If I can record and watch additional games later on Saturday/Sunday, life is good. Hi Gaffer – thanks for all the great updates here – excited for the start of the season. dstorm, I’m definitely considering it, but I want to see how the schedule looks for the first week before I figure out the best way to format it. Thank for the suggestion. Will the games be replayed or shown on delay later on the day (Saturday)? FSC used to show the EPL matches staggered throughtout the day and I would DVR every game & watch them. I’m really looking forward to the matches on NBC. I know most people who comment here aren’t MLS fans. But you should watch a match broadcasted on NBC Sports Network (usually on Saturday or Sunday nights). The quality is way beyond any coverage Fox Soccer provided. This coming Saturday’s match is KC vs NY Red Bulls…pregame at 630pm EST…match follows at 7pm. Actually should be a decent match from what I’ve seen. Hopefully the NBC free to air experience is better than the Fox free to air experience. I’m sure my local NBC affiliate will do their best to ruin it for me with live weather updates or some other s*it filling up the screen. Games on CNBC too. I’m going to need a PhD to set my DVR. Hey never let it be said I’m not looking out for you guys stuck with TWC – they just called me because I recently cancelled and I made sure to explain – TO A SUPERVISOR NO LESS – exactly why. Told him to check out this website in fact so that he knew exactly what they should have been adding. You are a saint, but I’m confident TWC will come through in the end. They always do. They just seem to have the need to hassle, hassle till the bitter end. Well thanks, but it is the least any of us can do. These uber-companies pretty well ignore individuals but if enough individuals keep giving the same reason for “why I am cancelling” that might shake them out of their corporate inertia/torpor a bit. Ok Gaffer right now with my cable package I have NBC, NBCSP, CNBC, MSNBC so what other Channels do I need to get the games? I don’t want or need any online options I just need to make sure I have all the bases covered in terms of channels for the UTD games. If you don’t want the online option, you just need to make sure that your TV provider will provide Premier League Extra Time for those Manchester United games that are not shown on the channels you mentioned above. Cheers gaffer as always you’re full of great up to date information. Just set my DVR (att uverse). Replays of EPL matches from last season start 8/10 on NBCSN. Then Premier League Club Selection 8/8, Premier League Countdown 8/8. Let the good times roll!!!! Yayyy, I have Dish, so all I do now is call them and ask them to add Premier League live extra package? Any news yet if Brighthouse will be carrying it? Christopher – Could you please tell me if the NBC Sports Network channel is in HD…and if so, which providers are providing it in HD? It seems Direct TV does not offer it in HD. Also, will Premier League Extra Time be offered in HD? Channel 220 in HD. The Extra Time will be in HD in the 700 channels. Will Charter Communications offer NBC Sports and the app? Charter currently doesn’t offer NBC Sports Live Extra or Premier League Extra Time. Is there anywhere to watch the championship online? I am a Time Warner Cable customer and after calling regularly for the past few weeks I finally got some decent information – they said that the negotiations had been extended and a decision one way or the other will be reached on Friday 2nd August – although he didnt know, i asked him what he thought was likely to happen on Friday and he said that he reckoned that an agreement would be reached on Friday – fingers crossed !!!! Both Direct TV and Dish will be carrying the Extra Time, Right? Anyone have a preference between the two? I’d still like to be able to keep any FOX Soccer and/or BeIn channels. Leo, it’s complicated. Yes, both DirecTV and DISH Network will have Premier League Extra Time. But neither TV provider will be carrying, as of press time, FOX Sports 1, which means you’ll miss out on UEFA Champions League games. However both do carry beIN SPORT. By the time FOX Sports 1 launches on August 17, DISH and DirecTV should carry FOX Sports 1. Hopefully. Has anyone heard confirmation from Comcast/Xfinity that Premier League Extra Time will indeed be available for all subscribers? Some affiliates may choose not to make it available to it’s area. I have not seen any press release from Comcast as of yet. The TV providers don’t typically issue press releases to announce the news. NBC confirmed to me that Premier League Extra Time is a nationwide rollout to Comcast. And don’t forget that NBC is owned by Comcast. Sure hope so! Thanks Gaffer. I may be cancelling Brighthouse Network as my cable and picking up either Direct TV or Dish. I’d still like to be able to keep BeIn. Having said that – which satellite provider might be better? Will either satellite carrier carry FOX Sports 1? Thanks Gaffer. I have no idea what to believe anymore! It’s becoming a big pain in the youknowwhat. I have Directv and I was wondering if I will be able to watch all games in English or will I have to watch some on Spanish channels because Directv does not have Telemundo. All the games that are shown on Spanish-language television will be shown on English-language TV, too. I have AT&T U-verse and just noticed they have channels 691-697/1691-1697 (HD) and it is listed right now as Sports Alternative #. I don’t remember this being there previously. Is there a good chance this will be where U-verse subscribers will find Premier League Extra Time? 600’s/1600’s is where almost all the soccer channels are/have been.